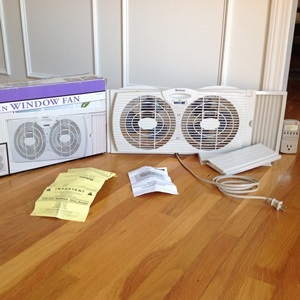 Holmes Dual Blade Twin Window Fan Review: How It Solves “Heat” Problems for People? Are you compromising with the scorching heat of Summer because you don’t have the budget for an AC? There are numerous ways to keep you and your family cool in the Summer weather. One of these is to get a “Window” fan. Those of you who aren’t particularly familiar with it, a window fan is great when it comes to getting cool air in and at times, getting the hot air out of the kitchen. Don’t frown yet. These fans carry a lot of benefits within a small size as my Holmes Dual Blade Twin Window Fan Review will tell you. These fans have more to offer than simply size and air volume of air. 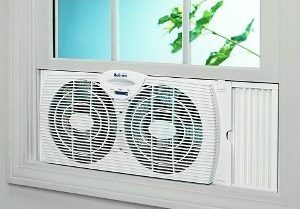 Holmes Dual Blade Twin Window Fan is waterproof and is better than its competitors in multiple aspects. Let us scour through the benefits to find out which things it does better than the others. The name says a lot about how the fan is designed. It is a Twin-window fan. These twin windows bring cool air in. But the functionality doesn’t end there! Set it near the window and this thing plays the role of an exhaust fan as well. This fan is made of plastic. People might complain about the durability. Yet, I can vouch for the strength of the material. It can withstand shocks due to falling from a height. Holmes Dual Blade fan comes with an extension too. It works like a charm when you need to fit the fan with a window that’s wider than normal ones. You can fit this thing in normal windows as well as into those which slide. The “Twin Blades” make this design impressive too! Twin blades can drive home twice the volume of air than others of the same caliber do. These 6-inch blades spin well thanks to the curved design. The operation is Super Easy for Newbies! Seriously! Operating the fan is not rocket science. You have fewer buttons to worry about in the control panel. The display is larger than the competitors so that people can get a good view of what’s happening inside. You need to turn it on and that’s it. There are “Two Speed Levels” that you can work with. Switching between them is rather easy. One needs to operate a slider that switches power between high and low. The third stop on the slider turns it off. Switching between the exhaust fan and the normal one is something of a task. One needs to turn the fan manually to the other side to make sure it pushes the air out. It’s not automatic. Dual Window fans have a common problem. That is, they don’t have a motor that can last the demanding hours during summer. Especially, when these fans function as air exhausts. One needs a motor for all the seasons. Luckily, Holmes Twin Window fan delivers in that aspect too. You have a motor that consumes less power than the contemporaries. By less, I mean 60% less than what you’d expect from a device like this. Also, this thing is water resistant or I should say waterproof. This helps as one can expect this device to be at the peak of its game when the rainy season approaches after summer. Does the “Chinese” Design Dictate Performance? To me? No. Sure, Holmes is a Chinese brand. Yet, the design holds up. You have the advantage of low power consumption by your side. The thermostat adapts to the dual-hung windows and sliders. I like how the power cable supplies 18AWG power. Then you have the length of the cable. A 5-feet cable is just what you need for an exhaust fan such as this. It’s not too big or too small for the job. From the experience I had with it, I can say that it does the job just as a “Small” AC would. Run it for one hour in the kitchen either as a source of cool air or an exhaust fan. You’ll understand. I liked the simplistic design of this device. It isn’t flashy yet it stays true to the basics. It consumes 60% less power than its competitors. Precisely 35 watts on low and 53 on high settings. The dual blades do the job. You can expect them to drive more air inside and outside if need be. 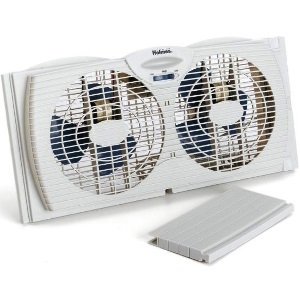 Holmes dual-blade fan goes well with sliding or double hung just fine without pulling a stunt. I could brag about the waterproof motor any day. It keeps the fan relevant in rainy seasons as well. The “Plastic” oriented design might seem flimsy to some users. You have to manually turn the fan to the other side if you want to turn this into an exhaust fan. Nobody likes lengthy reviews that sing praises of the product. That’s why I kept my Holmes Dual Blade Twin Window fan review on the shorter side. Despite it being short, I’ve told you all that needed to be said. With a small footprint and easy controls, there’s hardly anything this fan leaves to be desired. People get a device that is low on noise. You can fit it with hung out or sliding windows. Dual blades drive more air inside and out. Changing the direction of the blades can be troublesome for users. The design might leave things to be desired too. Yet, at this price, you take all you get to be honest. I am not complaining.